WASHINGTON (FinalCall.com) – More than 30 years have now passed since the worse abuse of police authority in modern American history. On May 13, 1985 a massive police operation was launched in Philadelphia after Wilson Goode, the city’s first Black mayor, abdicated his authority over the police force permitting its racist commanders to first rain a 10,000 bullet fusillade, before executing a helicopter bombing of the headquarters of a radical, Black naturalist organization known as MOVE. 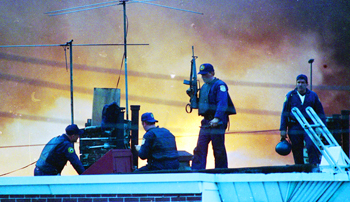 Armed Philadelphia police offi cers man a rooftop as the sky is illuminated by the fl ames from a neighborhood in West Philadelphia, Pa., that burned after police dropped a bomb on a building occupied by members of MOVE, May 13, 1985. The fire caused by the attack incinerated six adults and five children, and destroyed 65 homes and two city blocks. Despite two grand jury investigations and a commission finding that top officials were grossly negligent, no one from the city government was criminally charged. MOVE was a radical movement dedicated to Black liberation and a back-to-nature lifestyle. It was founded by John Africa, and all its members took on the surname Africa. Ramona Africa is the only adult survivor of the vicious attack. In 2010 she told “Democracy Now!” what happened. “In terms of the bombing, after being attacked the way we were, first with four deluge hoses by the fire department and then tons of tear gas, and then being shot at—the police admit to shooting over 10,000 rounds of bullets at us in the first 90 minutes—there was a lull. You know, it was quiet for a little bit. Linn Washington is a journalist, a former columnist for The Philadelphia Tribune and a Temple University journalism professor, who has covered MOVE for nearly 40 years. “The bullets were so intense that they were raining from the sky like hail—and then, later in the afternoon, to see a bomb dropped on a house occupied by children. And then the very callous decision of the authorities to let the fire burn was just unreal. It’s a sight and a memory that I can’t get out of my mind,” he said. When MOVE members realized that their house was on fire, some tried to escape the inferno, but then, police opened fire on them, driving some of them back into the house to die. 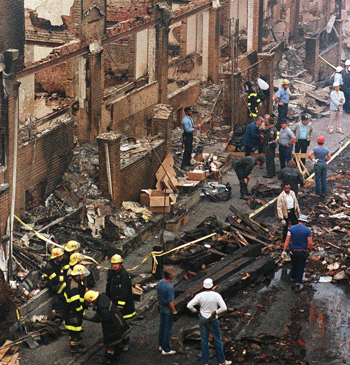 In this May 15, 1985 file photo, people sort through debris on Osage Avenue in Philadelphia, after a blaze destroyed scores of homes in the area. The fire started when police dropped a bomb onto the house of the group MOVE, and it spread throughout the area. The scars which provoked the MOVE tragedy go back to the heavy-handed, Gestapo-like police tactics of former Police Commissioner Frank Rizzo, who led a 1978 attack on a MOVE compound which resulted in the jailing of nine members who received jail sentences totaling hundreds of years according to Mr. Washington. In addition, MOVE suffered from a bias against them which White anti-government communes at the time did not face. And their lifestyle—believing that no creatures, not even rats, roaches, or other vermin should be killed—conflicted with their neighbors in an urban setting. Their lifestyle would have been far more compatible in a rural setting, Mr. Washington said. MOVE members even harassed neighbors who sought to exterminate vermin on their property, setting up a confrontation with the city administration which had to deal with complaints from neighbors who had grown tired of the intransigence shown by MOVE. On Christmas day 1984, Mr. Washington recalls, loud speakers were set up on the roof of their compound, and for 24 hours they blared loud music which some neighbors found insufferable. But the neighbors there on Osage Avenue in West Philadelphia, were just as poorly served by the Goode administration as was MOVE, Mr. Washington said. “The neighbors felt that the punishment (meted out against MOVE) far exceeded the crimes. Let’s understand, at that point, the neighbors were then crime victims—the crimes that were committed by the city government. Their homes were burned to the ground because of negligence, incompetence and callousness on the part of city government,” Mr. Washington continued. City officials ignored the neighbors and even entreaties from MOVE itself, as the confrontation approached. “In the hours before the shootout, there were efforts to reach a negotiated settlement, but the city administration, Wilson Goode refused to even listen to that,” Mr. Washington said. “I actually ran into the right hand man of (MOVE founder) John Africa, and he was trying to reach Mayor Goode, and he was in the company of a prominent Civil Rights activist from West Philadelphia and a former judge—a guy named Robert Williams—who was the Democratic candidate for District Attorney. All three of them were on the phone trying to reach Goode, and Goode’s city hall office wouldn’t put them through to Goode, so they subsequently called the Chief Justice of the Pennsylvania Supreme Court at that time, a Black man named Robert Nix. Nix called Goode’s office and Goode’s office wouldn’t even put the chief justice of the Pennsylvania Supreme Court in touch with Goode. Mayor Goode had apparently surrendered to following the prevailing police and judicial hostility to MOVE. In one instance, for example, when MOVE members followed court orders and moved to Richmond, Va. following the 1978 confrontation, Philadelphia police actually went to Richmond where they arrested the members for moving out of the city, even though they were complying with a court agreement. In another instance, MOVE members were denied parole from prison and ordered into anger management sessions, even though the members involved had already been certified by the prison as anger management counselors, Mr. Washington recalled. The gross mistreatment of MOVE also helped radicalize journalist Mumia Abu-Jamal, earning him the ongoing hostility of the police and courts, which eventually led to his 1982 conviction—in a trial which Amnesty International and other human rights observers have declared to be grossly unfair—for murdering a Philadelphia police officer. Mr. Abu-Jamal steadfastly maintains his innocence, and remains imprisoned and in declining health while receiving what his supporters insist is inadequate medical attention. His sentence was commuted to life without parole, when the Supreme Court overturned the sentencing phase of his trial. Afraid that a new sentencing trial would open up the guilt-phase of the trial to possible appeals, prosecutors opted to commute his sentence. In a commentary—part of his ongoing series of commentaries which began when he was on death row, Mr. Abu-Jamal reacted to the 30th anniversary of the MOVE bombing. “Why should we care what happened on May 13th, 1985? Because what happened then is a harbinger of what’s happening now all across America. I don’t mean bombing people—not yet, that is. I mean the visceral hatreds and violent contempt once held for MOVE is now visited upon average people, not just radicals and revolutionaries like MOVE. “In May 1985, police officials justified the vicious attacks on MOVE children by saying they, too, were combatants. In Ferguson, Missouri, as police and National Guard confronted citizens, guess how cops described them in their own files. ‘Enemies.’ Enemy combatants, anyone? Then look at 12-year-old Tamir Rice of Cleveland. Boys, men, girls, women—it doesn’t matter,” Mr. Abu-Jamal said in his commentary, broadcast by Prison Radio.org. “There is a direct line from then to now. May 13, 1985, led to the eerie robocop present. If it had been justly and widely condemned then, there would be no now, no Ferguson, no South Carolina, no Los Angeles, no Baltimore. The barbaric police bombing of May 13, 1985, and the whitewash of the murders of 11 MOVE men, women and children opened a door that still has not been closed. We are today living with those consequences,” he concluded. “His conviction is clearly an overreach,” Mr. Washington said. “As a reporter he became increasingly radicalized by the injustice that he saw MOVE experiencing—the 1978 shootout, the conviction of those persons in a long and ugly and incredibly corrupt trial. “One MOVE member was beaten to a pulp, live on television. Three or four police officers were eventually put on trial. The district attorney took a year to be able to find out who the people were. They put them on trial. They brought in a jury from out of town to make sure the rights of the police officers were recognized. Then after the prosecution put on its case, the judge issued a directed verdict of acquittal, freeing the police officers, even before the defense put on one witness,” Mr. Washington said. Ironically, MOVE is larger, stronger, and more widely embraced in Philadelphia, nationally, and even internationally, than they were in 1985, Mr. Washington noted. Their new headquarters is barely distinguishable from the homes of the neighbors surrounding them, and with an increased number of children, their ranks have swollen to perhaps 100 members.